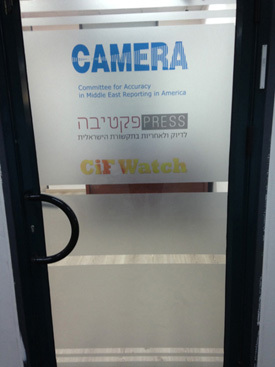 The CiF Watch office in Jerusalem is now open for business! We’re proud to announce that our sponsor, CAMERA (the Committee for Accuracy in Middle East Reporting in America), has expanded its Israel operations with the opening of a main office in Jerusalem this week. The new Jerusalem facility will serve as the center for CAMERA’s presence in the Jewish state and will enable increased activity in promoting accurate coverage of Israel and the Middle East in the North American, European and Israeli media. The office, which is located at a technology park which houses several major international media outlets as well as Israel’s Government Press Office, will be the new home office and will be home to two CAMERA affiliates. Presspectiva (www.presspectiva.org.il), CAMERA’s popular Hebrew-language website launched in 2010, will share space with CiF Watch. BBC Watch (www.bbcwatch.org), our sister site, will continue to operate from its branch in northern Israel. CAMERA, Presspectiva, CiF Watch and BBC Watch are responsible for securing countless corrections in leading print and broadcast outlets on key subjects such as Palestinian prisoners, Israeli policies towards the Gaza Strip, sensitive holy sites, and many others. Staff members regularly communicate with journalists and publish op-eds and letters to the editor which clarify and focus on topics frequently misrepresented by mainstream media reporting. “In the last nine years, certain Israeli news editors have internalized an important lesson. If at one time they thought they were better off disregarding our findings, they now realize it is in their interest to respond to our calls for accountability and accuracy,” noted Tamar Sternthal, Director of the Israel office, who joined CAMERA in Boston in 1999 and subsequently opened CAMERA’s virtual office in Israel in 2004. CAMERA and Presspectiva have submitted several complaints to the Israel Press Council, resulting in corrections made by Israeli media outlets. “All too often, misinformation appearing in the international media originated from Israeli sources, underscoring the importance of Presspectiva’s work,” said Jerusalem native Yishai Goldflam, Editor-in-Chief of Presspectiva. “The establishment of the Jerusalem office is the natural next step in the ongoing growth of CAMERA’s global efforts. We look forward to hosting events and conferences for both the Hebrew and English-speaking public,” stated Andrea Levin, President and Executive Director of CAMERA, from the organization’s Boston headquarters. Mazal Tov – I follow your articles closely. Your brave attemps at stemming the tide of anti-Israeli press the world over is much appreciated. I have always said that if I didnt know the real story I would also believe the horrendous lies about Israel. And how could they be better spent? Financing your sour grapes, oh twisted poster of many names? Mazel tov! May you go from strength to strength. Mazel tov! May the force be with you. Congratulations to Adam and colleagues. I hope you have room for an extension as when “The Guardian” abandons its print edition and goes digital only, your workload will increase. Mazal tov and may you go מחיל אל חיל – from strength to strength. Sorry I’m a little late. Congratulations and all good wishes to Adam and the team.